Discover the most efficient ways to pack for your next trip abroad! Whether you’re exploring Europe for a month or Central America for a week, you’re going to need to pack a bag. There is a difference between traveling light and traveling unprepared, and it helps to do your research before throwing your shirts and shoes into a suitcase. 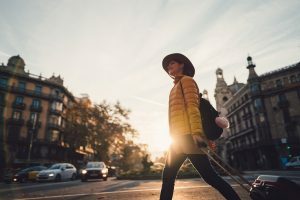 Lucky for you, we’ve compiled a list of helpful tips by globetrotting experts to ensure an enjoyable and successful journey ahead. Happy packing! It doesn’t matter if you use an organizational app or a sheet of paper, it’s essential to make a packing checklist. There are obvious items to remember, such as your passport and clean underwear, but consider the area that you’re about to explore. If it’s a warmer climate, you’ll need a bathing suit, and if it’s a colder climate, you’ll need an extra layer. Every traveler packs specifically to suit their destination, so do your homework before you begin! Every explorer prefers to pack their clothing differently, but experts agree that rolling is more efficient and kinder to your fabrics. Not only does rolling your shirts and pants provide more room in the suitcase, but it also decreases the chance of wrinkles. If you’re checking a suitcase, most airlines allow you to carry a smaller bag onto the plane with you. Transfer your in-flight essentials, such as headphones and wallet, into a zippered pouch and store in a secure pocket of your carry-on. Consider packing an extra change of clothes as well. You might want to change into a fresh shirt once you land, depending on the length of your flight. When it comes to traveling abroad, less is truly more. As a rule, pack your suitcase once, and then subtract half of the items you initially planned to bring. By removing half of your clothing, you can determine what is necessary and what takes up more space. Consider planning your daily outfits ahead of time to cut down on excess packing. AESU offers unique, thrilling travel programs for college students and young professionals at affordable rates. Each trip is action-packed and informal—designed just for people your own age. We are also able to design custom tours just for your group. Experience an exhilarating adventure on the Cosmopolitan, Explorer, and Continental tours. It’s never too late to get a taste of a multitude of exciting cultures! If you have any questions or want help booking your European adventure, please contact AESU by calling 800-638-7640, or fill out the contact form found on our website! This entry was posted on Wednesday, February 28th, 2018	at 10:59 am	. You can follow any responses to this entry through the RSS 2.0	feed. You can leave a response, or trackback from your own site.